Treating Welsh patients at a Cheshire hospital is "hard to countenance" when it costs "up to £4m each year", the chairman of its trust has said. About 20% of the Countess of Chester Hospital's patients live in Wales. Sir Duncan Nichol said that meant it was "not being paid for all" its work. The Welsh government said its patients were funded in line with the pricing rules set by the NHS in England, while a health watchdog has called Sir Duncan's comments "disgraceful". North Wales Community Health Council's Geoff Ryall-Harvey said the hospital was "built to serve people in North East Wales" and would be "better off working on co-operation with [Welsh NHS commissioners] rather than making this inflammatory statement". 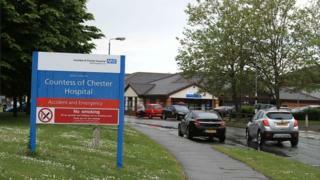 The Chester hospital has forecasted its accounts will be in deficit by £12.7m by April 2019. Speaking at a meeting of the trust's board of directors, Sir Duncan said the matter was "a conversation we need to have with Wales". "We need to be paid for what we can do, unless somebody can point out that we can do it more efficiently." Funding from the NHS in Wales makes up 11% of the income for the Countess of Chester Hospital NHS Trust, while Betsi Cadwaladr University Health Board, which funds North Wales patients treated in Chester, is the second largest funding provider to the hospital. Executive director Russell Favager said the health board paid the hospital for "healthcare activity in line with the English national 'payment by results' tariff as we do with all other contracted and non-contracted activity provided by English hospitals".